4 Bedroom Detached Bungalow For Sale in Camberley for Offers Over £550,000. Carson and Co are pleased to offer to the market this much loved four bedroom detached family home with single garage and large driveway. 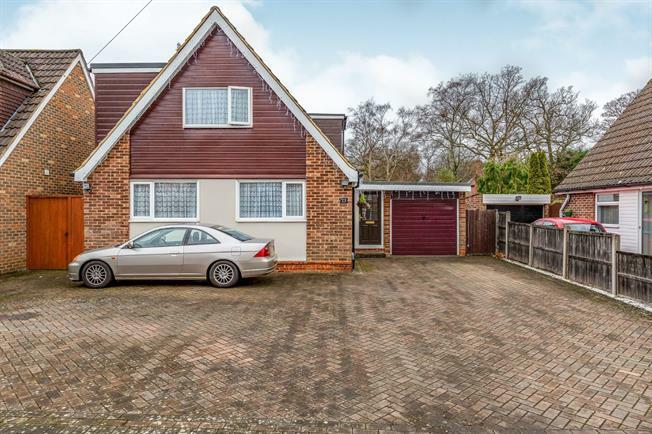 Nestled on a well regarded residential road the property lies a short distance from local amenities within Darby green and Blackwater. The property offers incredibly versatile accommodation and is presented in immaculate order through out, approaching 1600 square feet in total, with existing plans to extend further. Downstairs there is a good size living space complete with feature gas fireplace, a formal dining area leading to the recently fitted kitchen, boasting integrated appliances with plenty of cupboard and worktop space. There is a double bedroom and downstairs w/c to accommodate downstairs living requirements plus an additional reception room. Upstairs there are three bedrooms including a master with en-suite and a family bathroom. Externally there is parking for multiple vehicles and a single garage. The private rear garden sports a favourable south aspect and is mostly laid to lawn whilst offering a delightful patio area for entertaining.